Almost all of us have a great thirst for fried foods. The lovely fragrance and the crispy texture of the foods make us crazy by making hunger instantly. These fried foods are very tempting, and we like to consume more and normally end up gaining weight. In contrast, for self-consciousness, many of us are so restrictive that we begin avoiding the food though we like them most. To ensure relax for the foodies, technologies have been changed greatly for cooking. At present, with the view of overeating your dear fries, you do not like to experience oil trickling down your fingers. 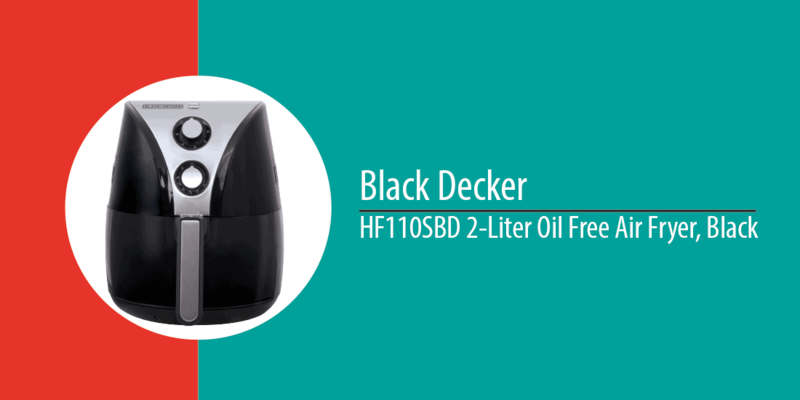 You do not use oil after all for many cases with 1 and only Black and Decker Air Fryer. The modern design of the unit has two indicator lights. On light indicates that the unit is powered on. The other light will help you to know the unit has reached the desired temperature by turning off. The capacity of the cooking basket is two liters. It means that there are more rooms for the fried food for two to three people. The fryer comes with a cookbook, though it is mainly for a snack. Find on online to know more about the recipes. There are two powerful convection fans in this fryer that distribute heated air over the foods. So the food cooks evenly and becomes crispy. The fan does it function with the temperature control to make an optimal condition for frozen foods or cooking raw to perfection. Set at your desired time. After this period the air fryer will automatically turn off when cooking time is over. The fryer cooks the food evenly; there is no need to see the cooking progress of food inside the air fryer. I like to use this type of air fryer as at the time of the kitchen I normally do not a thing about my food overcooking or won’t be ready. The fryer has variable temperature controlling system. You can adjust the temperature from 175 degrees F to 400 degrees F. You can cook various types of foods with the fryer. You can prepare pizza rolls, cheese sticks, fries, and vegetables with the fryers. The perfect setting for temperature and time may ensure good cooking for different foods. There are two indicators lights. One will indicate that the fryer is on and the other will tell you that it has reached the desired temperature. The Black & Decker HF110SBD holds two liters basket so you can cook eight cups at one time. At the time of cooking, the basket separator will help you to cook food separately. Cooking basket and the basket separator have a non-stick coating for simple cleanup when you finish cooking. The oil-free fryer is found with a basket separator, non-stick basket, along with the manual guide. Some people like to buy air fryer cookbook to cook different types of foods. The cookbook helps to cook special types of food for air frying. The most important feature of the fryer is that you do not need to use cooking oil at the time of cooking your favorite foods. Some people like to use the little oil to make the food more delicious. This has a severe impact on the health. So better, not to use the oil to avoid health risk. Adjust it with the first cooking times which the BLACK and DECKER HF 110SBD Purify 2- Liter Air Fryer gives. You are likely to talk about something very very special here. Some people do not like the appliance for having a small capacity. It has only two-liter capacity. For this, it can not cook for many people. Entertain many individuals with the unit is a great challenge for you. A more advantage of the air fryer is the cleanup process afterward. As it has no splatter of oil, the unit would not get greasy. Make sure the device is turned off, unplugged and cooled down. Be sure the device is cooled down, turned off and unplugged. Use a damp cloth to clean the unit. You can use the dishwasher to wash the separator or the basket of the air fryer. You can use hot soapy water or nonabrasive sponge to clean the basket or pan of the air fryer. Frying is considered the speediest way to cook meals. If you have a fryer with having great capacity, you can cook food less than an hour. This is the easiest way to prepare food for your lots of guests. Deep fryer gives you cleanliness. A deep fryer is a unit offers quick cooking experience and scrumptious sampling meals to escape distractions of the regular pan use. It can be very splashy as the smolder in a regular pan- it would be messy as well as unsafe. You desire to have a cooking unit having adjustable features of temperature settings. By setting the temperature you want, you can cook your desired food with the fryer. Different food will become crisp or golden with the different temperature setting. So choose the perfect one that can fulfill these desires. Try to get a good fryer that can offer good capacity. A deep fryer can cook large meals. If you like to cut your budget or would like to have a tiny fryer, you need to skimp on this big one. You desire to have a fryer that is simple to clean up. You know the fryer becomes oily or messy at the time of cooking something. This does not mean that after every cooking you have to clean it. It is just a regular thing. You need a unit that is dishwasher safe and involves less mess if you pour out oil. Dual Convection Fans- The unit has a dual convection fan to circulate hot air around the foods to make the food crispy. 60-Minute Timer- The unit comes with 60 minutes timer settings. After the fixed time it will turn off automatically. Variable Temperature Control- Try to find the accurate temperature setting to cook from frozen vegetable to pizza rolls. The temperature control ranges from 175-400°F. Indicator Lights- There are two indicator lights on the unit. One light indicates that the unit is powered on and the other will automatically turn off after finishing the setting times. I purchased Costco last week, and for this, I have to stab to buy for a long time. The problem is it is different enough from an oven worth getting. I would like to use it for healthy-ish fried foods. I have not got any store to see the models. I went ahead and bought it, and I am not happy. The Decker and the black air fryer are great in the sense that it needs no oil or a little oil. The foods are crispy and juicy without using oil. I use the fryer to make French fries, potato chips, fried chicken, hamburgers, cakes, and vegetables. The fryer requires no preheat, and it is faster than the oven. The fryer is very simple to clean as well. The unit is great no doubt. But my one complaint is that the food I can cook is enough for one to two people. The food is not good for more people. For doing so, you need to make it two to three patches. Therefore, the Black & Decker comes up with what they define cleaner, simpler, neater method. The first thing that you experience here is it is big, comparing how little food they can cook. It is thirteen inches high; a foot in diameter and weight is hefty twelve pounds. You can call it a countertop convection oven considering the function of it. There is a fan on the top to blow air to the heating elements of all-electric ranges. Under the element, there is a basket suspended inside the drawer. You may keep lightly oiled food inside the basket, and then start to use heat, and voila fried food having no mess. Inside the basket the food that you keep there will get hotter circulated air. For this, every side of food gets exposed air blast and does not do act with lots of foods. An air fryer is a revolutionary appliance which is now found almost in all families. The Black, as well as Decker Air Fryer, is the strong competitors in this segment. The other features are easy operations; the longevity of the appliance makes the fryer very popular to the people. If we do not think about the cons of the Black and Decker Air Fryer is suggest using everyone.